Thank you so much for making it possible for our team to reach race day. None of that could have been done without your generous sponsorship. At the competition we won the entry class competition and had a fantastic day. We may even enter development class next year. Thank you for making it possible. 3D Systems is optimizing the recently announced FabPro 1000 desktop printer for compatibility with selected NextDent biocompatible materials for specific dental applications, starting with surgical guides and orthodontic and denture models. "I fundamentally believe it starts with the materials - use case by use case, once you have the materials, hardware and software workflow, we can switch to digital" - Vyomesh Joshi, 3D Systems' CEO. When 3D Systems outlined its product roadmap at its Healthcare Technology Centre back in November, dental was a hot topic. Over the last few years, the 3D technologies leader has been busy making acquisitions and tweaking long-awaited technologies to address the entire ecosystem of what is st to become a 9.5 billion USD market over the next decade. Yesterday the company unveiled a new machine and 18 materials aimed specifically at the catapulting the dentistry market to a fully digital transformation. Launched at LMT Lab Day in Chicago 2018, 3D Systems debuted the NextDent 5100and 18 new NextDent resins. The NextDent 5100 will allow dental laboratories and clinics to address 11 indications with one solution including surgical guides, dental models and dentures, at a low price point of 10,000 USD/10,000 Euro. Based on its high-speed Figure 4 technology, 3D Systems' says the NextDent solution will enable labs to produce dental devices up to 4x faster than other solutions on the market whilst reducing material waste, cost and reliance upon milling centres. The expanded resin selection also brings the entire NextDent catalogue to a total of 30 dental-specific materials. Speaking with TCT, Vyomesh Joshi, 3D Systems' CEO, commented: "I fundamentally believe it starts with the materials and use case by use case once you have the materials, hardware and software workflow we can switch to digital. We phenomenally believe this introduction today can redefine digital." 3D Systems has expanded its NextDent material portfolio with an additional 18 resins. The solution is set to overhaul the manual process of producing prosthodontics and orthodontics to benefit both the dental labs and end-patient. It substitutes the time-consuming and often messy process of creating a mould, requiring multiple steps, materials and visits from the patient, for a more sophisticated and streamlined process. 3D Systems claims that by using the NextDent 5100 solution, dental labs can achieve a 70% to 80% decrease in the amount of time needed to produce dentures and halve the number of visits patients will need to make to their dentist. Rick Jacobs, VP and General Manager for Dental within 3D Systems elaborated: "What is important is that we have a solution for the end customer as well as the lab owner and doctor in the clinical site - both of them are in urgent need of a plug and play system with a trusted connection. The materials and the printer combination together with partnership with the leading dental software players in the market makes it possible to redefine digital dentistry." The printer is compatible with industry-standard state-of-the-art intra-oral scanning and software solutions, delivering more precise results than conventional manual production techniques. It also benefits from the largest portfolio of compatible resins available from any dental material supplier. With a broad range of colours to match the patient's own teeth and gums, all NextDent 3D printing materials are biocompatible, CE-certified, and also certified in accordance with medical device directive 93/42/EEC, listed at the FDA. The NextDent 5100 solution is currently in beta testing with select customers and pre-orders are expected to take place in the second quarter 2018 with general availability planned for summer. Positive feedback has been coming from users so far who are reporting high precision, ease of use, speed, efficiency and cost effectiveness. One customer Esteban Ponce, president of Danso Dental Lab based in San Diego, CA, said: "Through the choice of materials, quality, and speed of the system, we can reduce our reliance on milling centres for manufacturing and reduce our costs. When we worked with a milling centre to produce models, each one cost us $30. By employing the NextDent 5100 solution and producing the same model in-house, we realised a 90% reduction in cost." Last year, the dental printing industry grew by over 35 percent year-over-year for the second year in a row and metal and resin based printing 3D printing technologies are poised to become a leading manufacturing tool for dental products. Much of the digital ecosystem is already in place with 3D scanning devices already proven in the market and the ability to tap into NextDent's 80 years of material knowledge. Training and education will be a huge part of this and 3D Systems is already equipping its reseller network with the tools to pass on to customers, but VJ believes in the next five years, there's a huge opportunity for around 50% of dental indications to be produced with 3D printing. The FabPro 1000 has been upgraded for the dental market. "We have a real proof point," VJ explained. "If you look at Invisalign, right now we are doing 300,000 a day. It's all printed on 3D Systems printers so we know that when you provide that kind of a value to the customer you have a much better outcome for aligning their needs. We are now talking about that same view for dentures, crowns and jigs. I really think this is going to have the same kind of value proposition clarity for the end user and these all new 11 indications are going to see the same transformation." In addition, 3D Systems' has expanded the capabilities of its recently announced FabPro 1000 to make it suitable for use in the dental market. The sub-$5,000 desktop system is designed as an entry point tool for small customers working in lower volumes for items such as surgical guides and orthodontic or denture models. The FabPro comes bundled with 3D Systems' 3D Sprint software for preparation and optimisation of CAD data, and will be compatible with select NextDent biocompatible materials from Summer 2018. Speaking about the need for a diverse dental portfolio, VJ said: "A lab in India may have a very different need from a lab in the United States. We need to provide multiple solutions so that we will be able to cover the market and the power here is the NextDent materials." Rick added: "Depending on the size of the lab and the production they have to make every day, we believe we truly have a solution for everybody." VJ concludes: "We believe that for dentistry, we have a complete portfolio of hardware, materials and a software workflow so that you can go from entry level all the way to a solution for production." CDG are at the Develop3D Live Show at Warwick University on Tuesday 20th March. See the award winning ProJet 2500, plus the latest Omni, Intamsys and Zmorph 3D printers. You can't miss us! 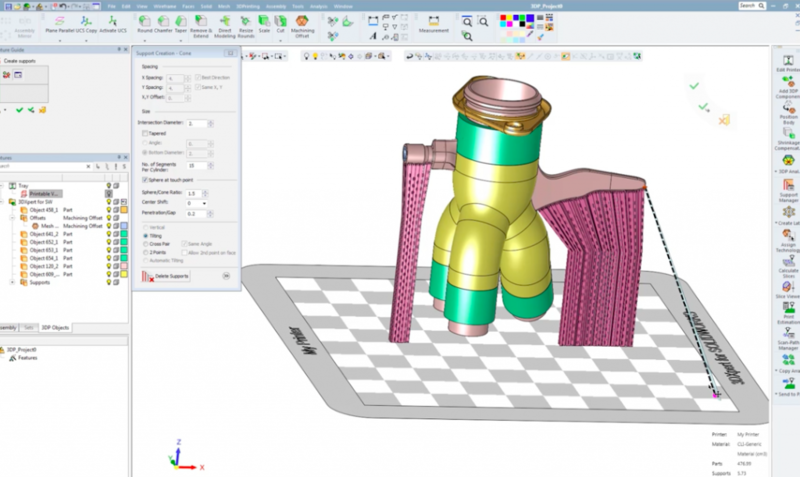 Market leading 3D printer manufacturer 3D Systems has announced the launch of 3DXpert for SolidWorks, a 3D print preparation software package that optimises 3D designs for additive manufacturing. 3DXpert is available exclusively to SOLIDWORKS customers as part of their annual subscription. The upgraded 3DXpert software includes a new range of tools to create a direct path from SOLIDWORKS designs to both metal and plastic additive manufacturing. 3DXpert for SOLIDWORKS workflow. Image via 3D Systems. Despite the importance of more of the workforce reorienting their existing skills in light of the growth of additive manufacturing, 3D Systems suggests that the difficulty of this is preventing some designers taking full advantage of 3D printing technologies. With the new 3DXpert software, SOLIDWORKS users will have the design freedom to deliver complex geometries, light-weight parts without compromising strength, and to apply surface textures that deliver functional or aesthetic benefits. As part of the design workflow in 3DXpert for SOLIDWORKS, designers can import native CAD data without the need to convert it to STL, and maintain the integrity of the original design until 3D printing it. Another important feature is the ability to optimize the object structure. This can be done through freely altering lattice structures or infill designs, modifying surface texture, and implementing automatic adjustments based on 3DXpert’s FEA linear-stress analysis. Similarly, support structures can be designed to simultaneously deliver quality prints and save material by minimizing supports. In 3DXpert for SOLIDWORKS, automatic analysis inserts supports where they are needed, but these can also be tilted, scaled, or reconfigured to facilitate their removal. Support structures can be edited freely to suit each 3D print job. Image via 3D Systems. Finally, print preparation time is streamlined with automatic features such as tray setup, estimations of material usage, and calculations of build time. “We are offering designers a true competitive advantage while re-defining the design and manufacturing process,” Joshi added. CDG are stocking the new super strong Carbon-filled Nylon filament. But even bigger news is that it is now certified for use on the Omni Factory 2.0 large-format Production filament 3D printer. This is a major development in for companies requiring optimum mechanical performance for 3D printed parts. The Omni enables batch production and XL part printing. Please ask for a free sample.